A common complaint I hear from people who don't want to participate in a local church is that they don't feel the need to join in with a bunch of hypocrites. But there are two kinds of hypocrisy (as the image to the left shows). The first is about appearances. It's the pretender who does his pretending for some perceived advantage. The second is about actions. It's the person who genuinely strives to live up to a standard even though he sometimes falls short. 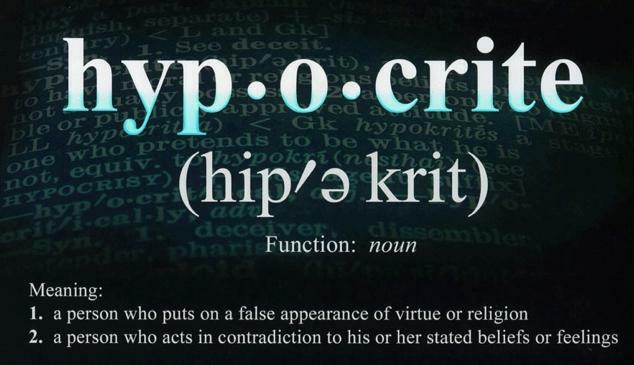 It's the first kind of hypocrite that the person is usually complaining about. 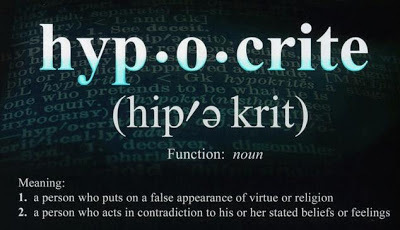 But it's the second kind of hypocrite that is usually found at church. "The person who says that he or she dislikes the the church because it is full of sinners and hypocrites makes the erroneous assumption that we in the church are embarrassed by our clientele. We are not any more embarrassed over our collection of sinners than a hospital is ashamed of its sick people. Sinners, hypocrites, men of little faith, outcasts, the sick, and hurting people were the ones who clustered around Jesus. This rather seedy cast of characters made Jesus not the least bit uncomfortable. They were precisely the reason why Jesus was in the world" (The Gospel for the Person Who Has Everything, 83).